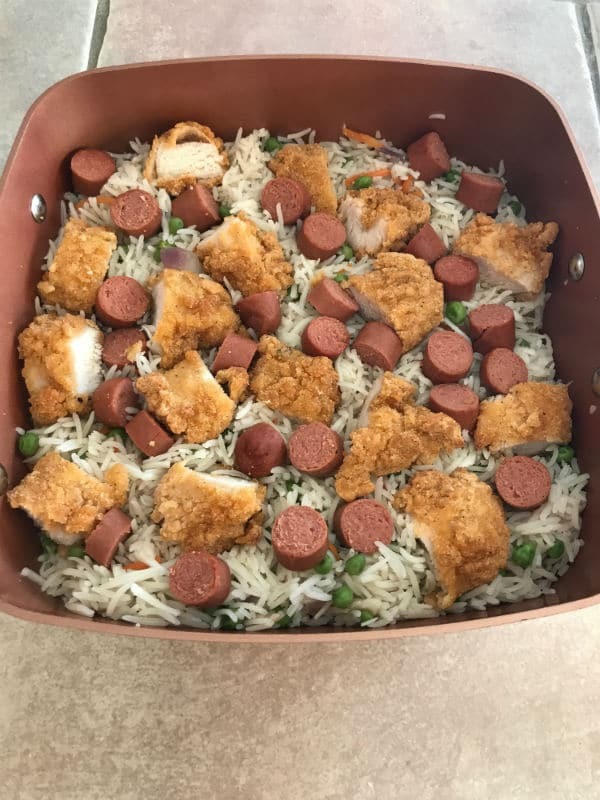 Cheesy Chicken Rice Bake, loaded with veggies, chicken and hot dogs. 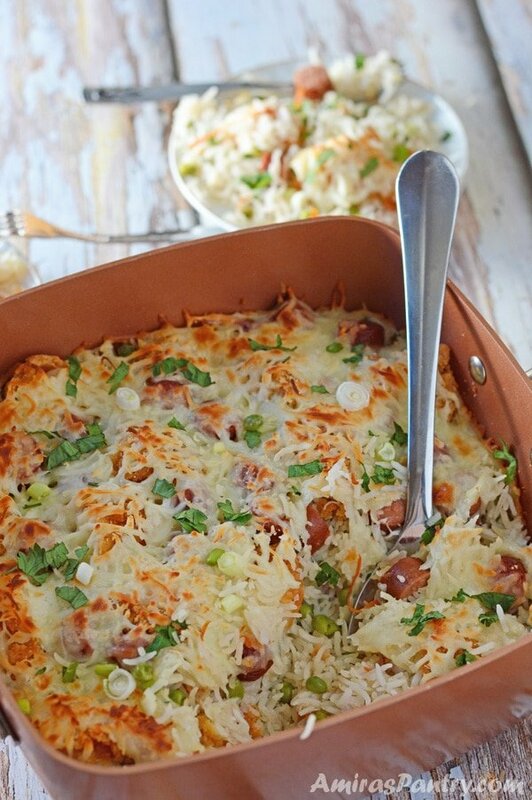 A family favorite, kids approved an all you can eat dinner in one pot. 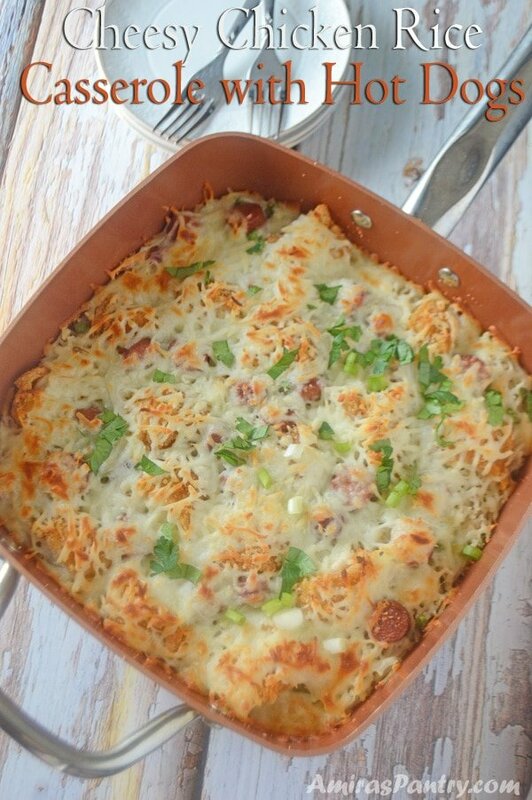 This casserole is very versatile and can be adapted to your family’s liking. 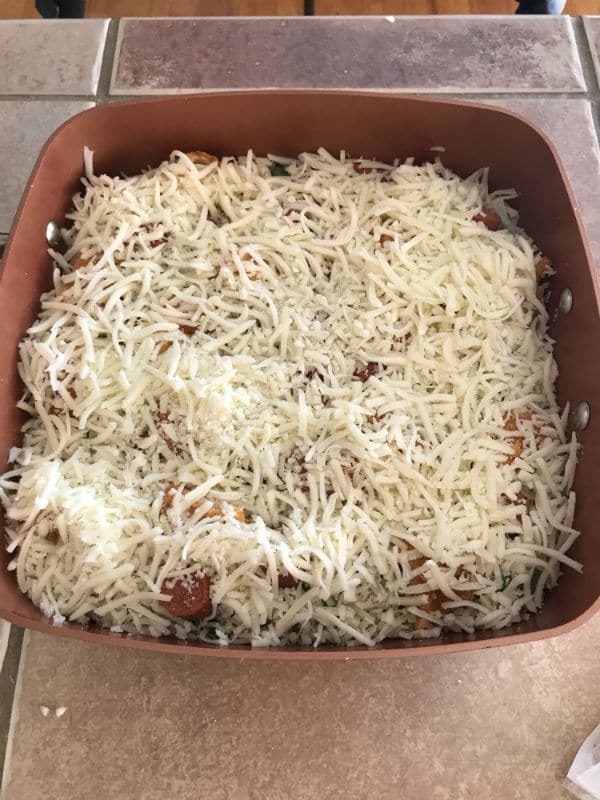 Load this casserole with the season’s best produce, add wild rice, brown rice, use chicken, ground meat or make it meatless then top all that with cheese oh so delicious. I want to share with you something that happened to me/my family this last week. One afternoon this past week, I was with one of my kids at his soccer game. Although I have talked to him A LOT and reminded him a zillion times to bring in the right uniform for the game, the right colors of the shirt/short and socks, he just forgot. I was so mad at him because you know these stuff show carelessness and above all his team is going to lose points this way. His coach was not happy with that and he barely allowed him to play. It is mistakes like this that makes me super angry and furious when I keep telling them to do something just to discover that they did not. I texted a friend saying ” Until when…..!!?”. When will they learn, when will they listen to what I am saying? 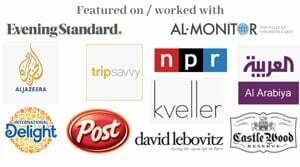 when will they do what I ask them to do?. I just felt like nothing I was saying or doing was making any difference. I felt that I am a bad parent and I am not doing what I am supposed to be doing. This friend texted back: “…Both you and your kid are completely normal! !, this happened to me and still happening and will happen and we will never stop reminding and encouraging and forgiving and they will keep making mistakes.”. Then I realized that this is parenting, yes it is overwhelming and sometimes I feel bad and I feel that I am not doing enough, but this is what parenting is all about, learning, both the parent and the child is in an ongoing learning journey that is never over. My mom is still up until these days talking and guiding and coaching me through life and I am still making mistakes and I am grateful for that. So I came to a conclusion, that I need to stop beating myself up, worrying about what I need to do or not do, stressing over what I need to change or not change. What will this person or that think about who is this child parent? how can they leave him do so and so. I will not worry anymore about people judging me as a parent, I will do my best as far as I know and as much as I could and I will love my kids as they are with their mistakes and teach them how to love back. One of the ways to show love, from a mom’s point of view, is a good meal. To cook something for the family that you know they will like. I have a kid who is obsessed with rice, my other two are with pasta, my hubby loved bread and for me I try to stay away from carbs as much as I can but I love ALL those previous kinds :). Let me show you how to prepare this easy meal. 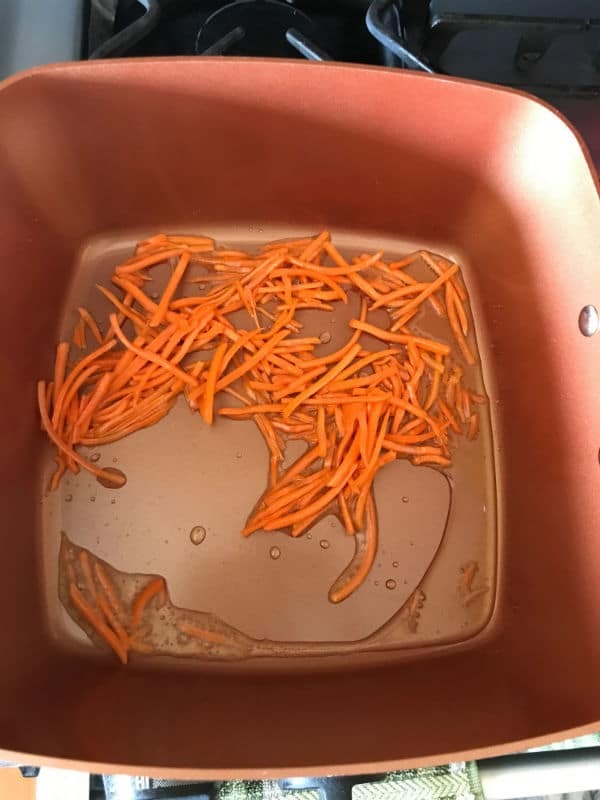 In some oil we will saute some shredded carrots until it gets dark. Then add some onions and saute. 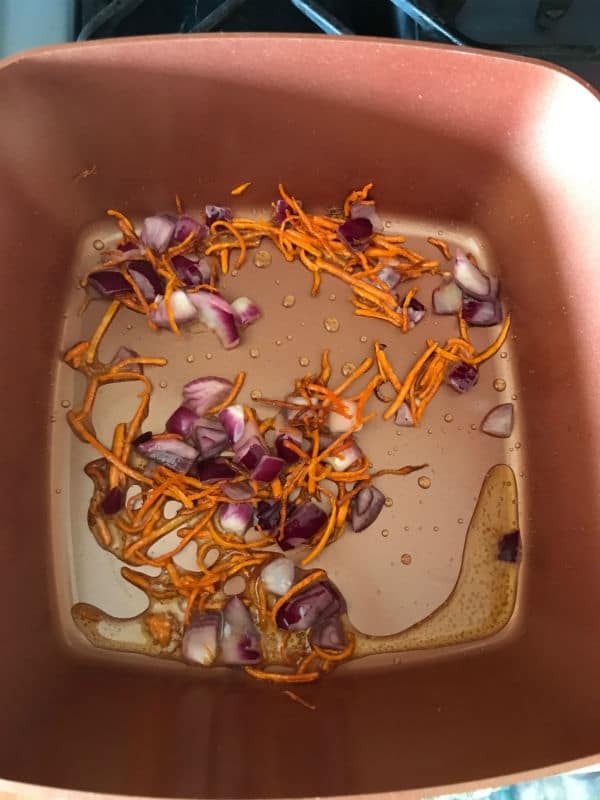 Now for some fragrance, we’ll add cinnamon stick, cloves and cardamoms. Add basmati rice, water bring to a boil then reduce heat until rice is almost done. When it absorbed all the water I added some frozen peas. Continue cooking until it is done. 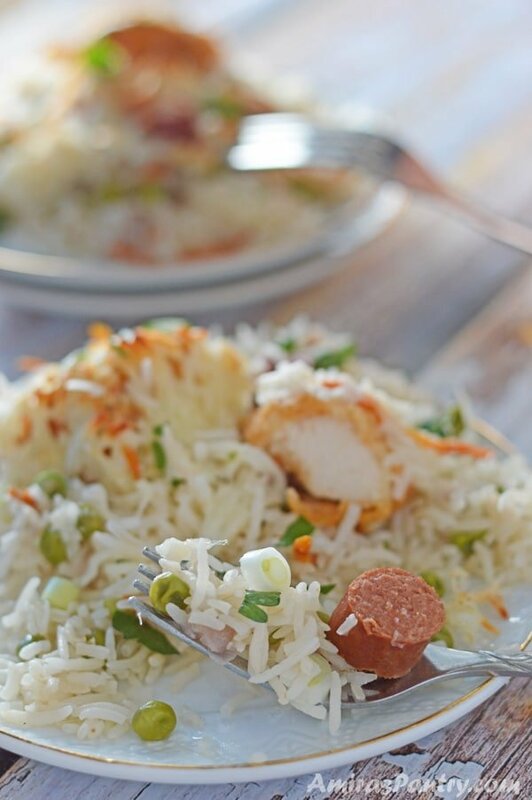 Fluff with fork then add the leftover chicken strips and hot dog or whatever leftover meat you have. 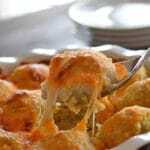 Add shredded mozzarella and bake or broil in the oven until the cheese melts or until it turns golden brown. 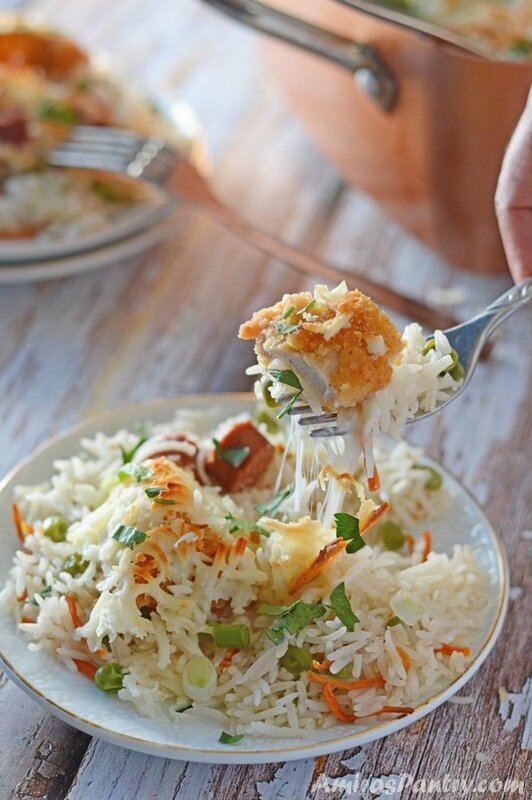 For a more cheesy dish I mixed the rice with a cup of shredded mozzarella as well. 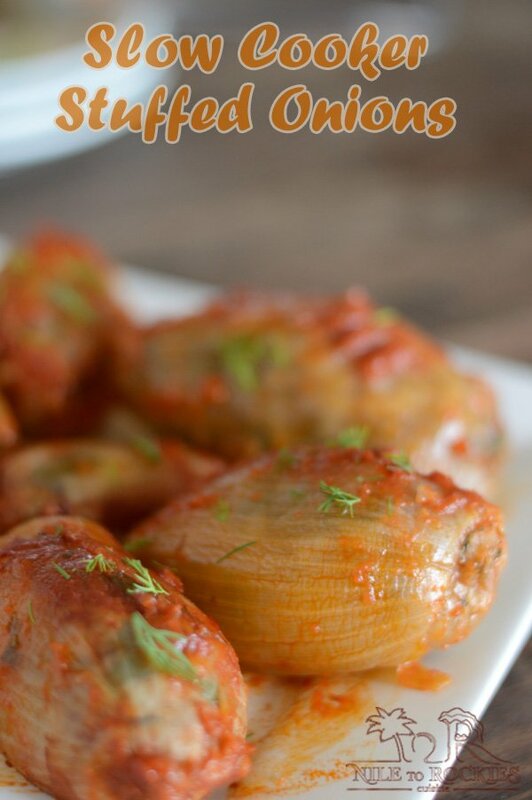 So easy and yummy dish. Next time I am going to add broccoli and minced meat, I bet this is going to get my little one ask for second and may be third as he is crazy about broccoli. 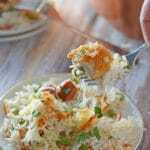 A leftover one pot meal easy to make and can be adapted to your family's liking. 1 cup frozen peas optional. 3 chicken strips about 300gm, cut into bite size pieces. 4 hot dogs cut into pieces. 8 oz mozzarella cheese more if you would like it. 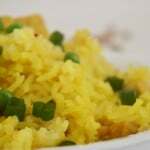 In a deep bowl, soak rice in cold water for 20-30 minutes. 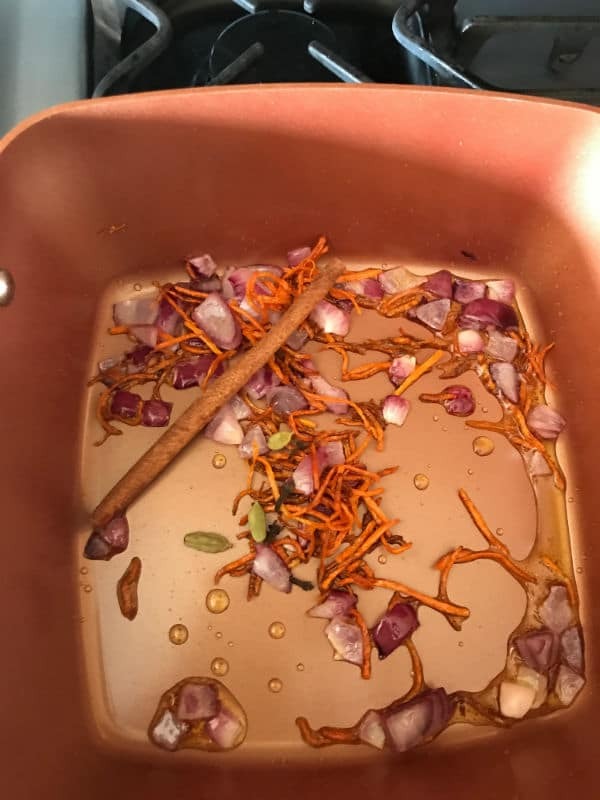 Heat oil in a large oven proof pan over medium-high heat add carrots and stir. Keep stirring until the carrots turn dark orange this will take almost 3 minutes. Add diced onions and cook for another 2 minutes. 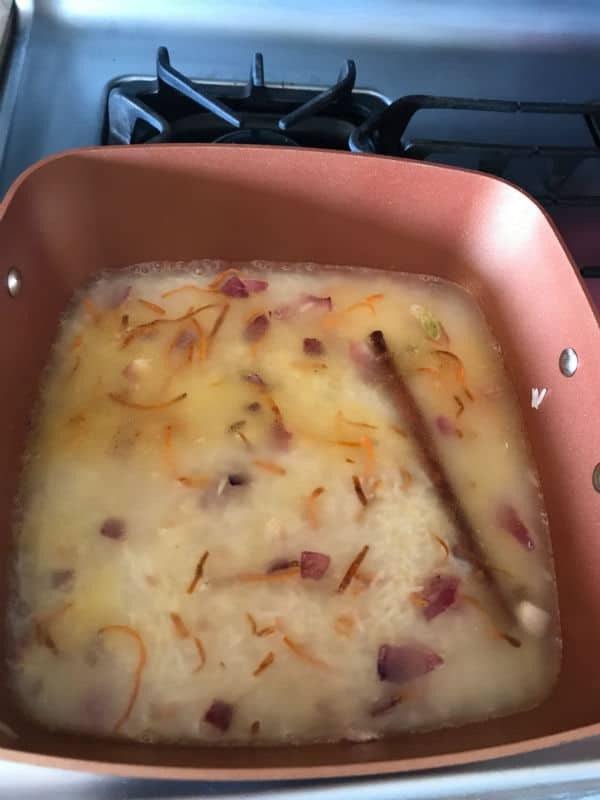 Add cinnamon, cardamom and cloves, stir for a minute to get the flavors out. Drain rice and wash thoroughly then add to the pan and stir. 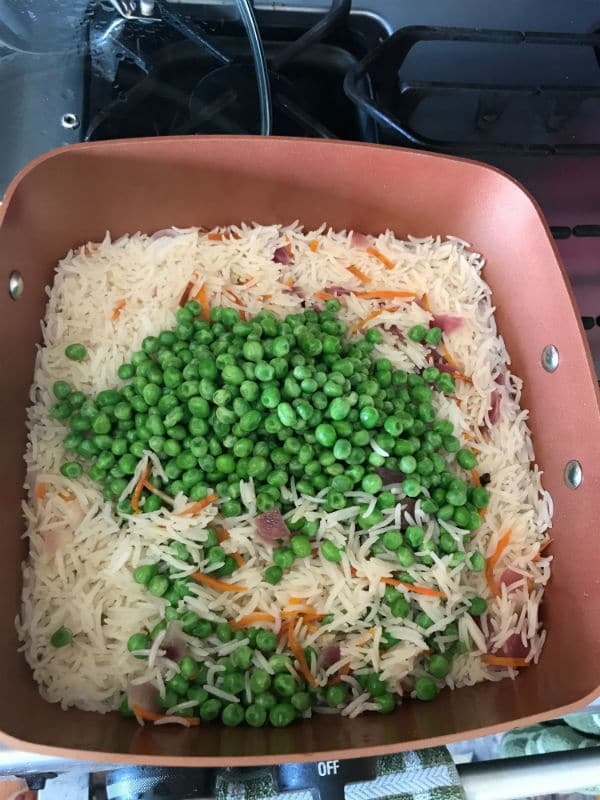 Just 5 minutes before it is completely cooked add the peas if using. Turn off the heat, arrange chicken strips and hot dog pieces on top then sprinkle mozzarella cheese. Pop in the oven until cheese melts or turn the broiler on for a golden top. 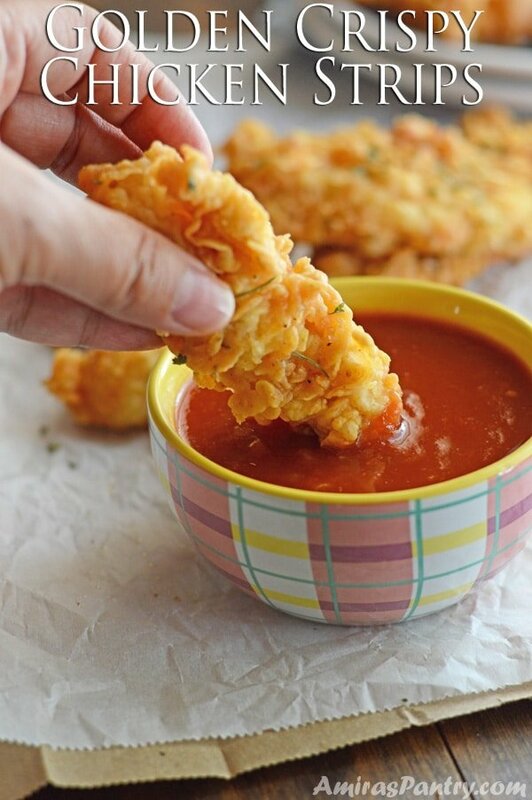 Serve with more veggies on the side. * Time and water depends on your rice type. 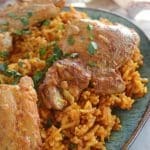 Now this looks like a dinner that the whole family would love! Regarding parenting, I’ve raised two children and discovered the best way for the kids to change their behavior is for them to suffer the negative consequences of their actions, rather than me nagging them. But hey, I’m no expert! I was inspired by your use of a video in your blog, so I learned some techniques and recently made my own blog video- the first video is lots of work but I think it will get easier next time! Thanks for this recipe. Fran, thanks for the advice dear. I got really mad but I did not rush home to bring him his stuff – in my previous life I would have- but I decided as you’ve just said let them suffer the consequences and not beat myself up and turn my day upside down. I hope they will eventually learn and be responsible for their actions :). Videos are lots of work I need to go check yours.